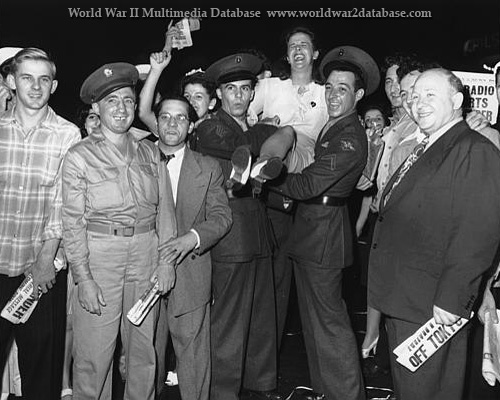 Starting on August 10, 1945, false reports of the end of the war caused premature celebrations across Canada and the United States. Most waited for the official word from US President Harry S Truman at the White House. As the negotiations progressed through early Tuesday morning, August 14. Throughout the day, thousands, then hundreds of thousands, gathered in Times Square to watch the "zipper" that gave updated information about the surrender. by 1900 750,000 people were pressing into 40th to 52nd Streets between 6th and 8th Avenues. At 1933 the official word of the acceptance of the Japanese surrender was flashed across the "zipper" and the crowd began to party. Some two million people crowded into Times Square. "Individual movement was virtually impossible; one moved not in the crowd but with it." said the New York Times. Women were forcibly kissed, barely able to recover from one soldier's affection before another embraced or kissed her. The party continued long into the night. The next day, over one million people again gathered in Times Square, continuing to revel in the surrender of Japan.